It's been a crazy week, thank goodness it's BOOK CLUB FRIDAY! So...Jodi Picoult has officially become one of my favourite authors. Even though she makes me cry. Even though she writes about heavy subject matter. Even though I'm so haunted by her characters that I think about them for days. Frankly, nobody's more surprised than I am. Perfect Match hit close to home for me, as I'm a former sexual assault crisis worker. Putting myself in Nina's shoes was easy. In fact, we wear the same size. Nina's is an assistant district attorney who prosecutes child molesters. She's also the mother of a five-year Nathaniel, who ends up being a survivor of sexual assault (I much prefer the term survivor to "victim" - it's about who has the power...oh man, now's not the time to really get started on that). 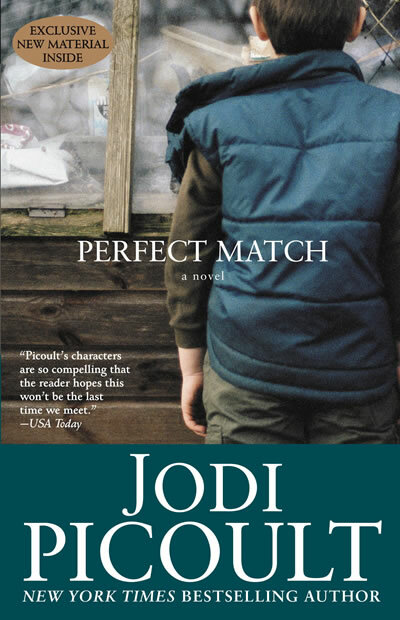 Perfect Match is about what happens after she finds out. Ms. Picoult wrote such perfect characters that I'm surprised they aren't real people. How she's able to completely capture the voice of Nina, her husband Caleb, her best friend Patrick, and Nathaniel is remarkable. I don't have a five-year-old son, or any children for that matter, but Nina's motherly emotions still cut through to my core. Courtroom scenes can be kind of dry sometimes but the ones in Perfect Match are like pieces of moist and seasoned chicken. Delicious and filling but won't put you in a coma, like turkey. My heart was almost ripped out of my chest at times, but thankfully Ms. Picoult did a great job of balancing the intense emotion amongst the characters. When one was losing it, another wasn't - greatly appreciated as a reader. Of course, there are lots of side-stories, including a few romantic ones and they add nicely to the overall flow without being distracting or out of place. There were parts that had me crying out "No!" which my hubby didn't really appreciate while he was watching The Green Hornet, but I couldn't help myself. If it wasn't so enthralling I probably would have been exhausted as it's a serious emotion-coaster. Definitely not an 'easy read' in terms of subject matter but it's totally worth picking up, especially if you're a front-line worker. There's no black-and-white in the world and that's the same in Perfect Match. Instead, we're taken on a journey through the muddled world of grey. It's murky in there and therefore easy to see how someone could go slightly off-track. Or, maybe, get them back on the right one. Oh wow! I haven't read any of Picoult's books before, but I do have one of them on my read list now! I haven't read any of her books either but I have Nineteen Minutes on my nightstand now. I have a ton of her books on my list to read. i LOVE jodi's books! her story lines and plots are always so intense and gripping that they keep me up late just so i can finish reading :) my favorite of hers is "the pact".